Not sure there's anything to be done with this issue, but I figured I'd ask. I don't find that OSX Spotlight finds Evernote items reliably -- or at least, brings them to the "highlight" dropdown that you activate with the command-spacebar key combo. For instance, typing "spring onion" doesn't show the recipe in spotlight that is in evernote that contains it. If i "show all" it shows up eventually. Another note, simply titled "next few weeks," created just yesterday, doesn't show up on the drown down. Is there any way to prioritize evernote in spotlight searches? I have moved documents to the top of the spotlight returned searches preferences, but that doesn't seem to be helping. This could just be me not knowing enough about spotlight, too. I recently purchased a new Mac and dutifully downloaded the Evernote client immediately. After some time the notes were through syncing and I was off. But then I noticed that none of my notes are hit by spotlight searches. Has something gone wrong during the install that is stopping spotlight from finding my notes? Delete the folder named "com.evernote.Evernote"
Also - if your Mac was brand new, then OS X may still have been processing the rest of your hard drive, so it may not have started working on Evernote yet. I'd let your Mac run for a day or so and try again. I'm having a bit of a hic-up with Spotlight searches. Evernote results don't show up in searches from the Spotlight magnifying glass menu in the finder, but I can see them if I go to a search window in the finder (via "show all" from the Spotlight menu, or via command-f from the finder). (So Evernote content is being indexed). Thanks Dave. I did search for a solution (on the Internet) before I posted this question. The idea would be to have Evernote results moved up the list of results on a Spotlight search. Although it's increasingly likely the info I want is in Evernote, it is not the only place I need to look. If my searches are specific enough (or the results few enough) an Evernote doc will come up as the "Top Hit" or among the first few results listed in one of the categories, like "Documents". But, if there are many results, the Evernote notes won't make the cut and I have to go to "Show All" to see the Evernote results. Ideally, Evernote notes would always show up, either in their own Category, or atop the Documents category results listed. If I want to search only Evernote, I can do that via Spotlight, all I have to do is type "whatever kind:evernote" ("whatever" being the string I'm searaching for) into the Spotlight search bx and I'll get only Evernote notes containing the "whatever" string returned in the results. I don't know of any special way to make our results come up higher in Spotlight (other than the method described in that article). Our "trick" for getting into the Spotlight results is fairly indirect ... we need to put secret files in a certain location that will be indexed by Spotlight to make it look like Evernote's data is on the file system. This indirection means that we aren't really doing anything at all at the moment you do the search, so we don't have any control over the order listed. I'm using Snow Leopard 10.6.6 with Evernote 2.0, and the notes in Evernote show up very inconsistently. When notes do show, they show in the folder ...Library/Caches/metadata/com.evernote.Evernote which makes me think that the original note is not being scanned by Spotlight at all. I have Spotlight set to show everything except music, fonts, and presentations, and to search everywhere except my external backup drive and a "Roxio Converted Items" for Toast. I haven't seen anyone else complaining about this.........am I the only one? Do a fresh, clean install of Lion (but you really don't have to; this issue is present on both Lion and Snow Leopard, on both clean installs and fully loaded machines…for me at least. You might want to skip to #5). Fill the documents folder with lots of misc documents (I put thousands there). Reboot the system, and give Spotlight plenty of time to index. [a] Cmd-Space (from anywhere), enter terms, then click "Show All in Finder" in the Spotlight drop down menu. Option-Cmd-Space (from anywhere), enter terms. [c] Cmd-F (from Finder), enter terms. …and note the fact that all three methods provide the expected results. Now, Install Evernote 3.0.1, start syncing and give Spotlight a few minutes to notice. • Spotlight search 4a above completely fails; no results. • Spotlight search 4b above completely fails; no results. • Spotlight search 4c above returns the expected results. Subsequent attempts to search using methods 4a and 4b make Finder unstable and periodically crash it. When Evernote is installed/synced, this folder is created: user/library/caches/metadata/coredata/com.evernote.Evernote and is what's crippling Spotlight. Until this is fixed, you can add the com.evernote.Evernote folder to the Spotlight Privacy tab in System Preferences and Spotlight will work right. Well sort of; you won't be able to use it to find your EN notes. Following up......I've done additional testing, and the above occurs every time. I just tried again with clean Lion install; nothing but EN installed. As soon as the metadata is downloaded from the service, Spotlight breaks. The only untested variable (that I can think of) is the Evernote account itself; each test has been done with my account, which is 7,500 notes @ 550MB or so. Is anyone else seeing the same broken Spotlight behavior? Did Saturday, but since it's a holiday weekend I didn't expect to hear anything until Tues or later. Mail, OmniOutliner and as good as any other app uses Lion's Spotlight previews - Evernote does not. Will this be fixed anytime soon? Does no Mac user miss this? I also got this issue, but it took me a while to realize it was Evernote. Awfully frustrating, and thanks for the privacy tip. I looked in Console and saw that it has something to do with displaying modified/created dates. Which may contradict the OP's use of the menubar search to reproduce, but hear me out. When I search using a Finder window, Finder crashes when I scroll to an Evernote entry. If I go into View Options, and uncheck the "Date Modified/Created" boxes from being displayed, I can run a search without a problem. Not sure what happened but spotlight does not seem to be indexing any of my evernote data...neither note titles nor content. Am I missing something? it sould be. but, i don't use spotlight. i use houdahspot, which draws on the indexes made by spotlight, but is much easier to use. it's free to try. yikes. that is weird... maybe someone with more mac knowledge can jump in here and give us a tip. I don't know if I have more Mac knowledge than the next person, in the sense that I don't think I can be of any help in diagnosing the problem. But I would suggest trying to rebuild the Spotlight index. Spotlight returns lots of Evernote notes for me. I'm running Evernote 3.1.2 beta 1 and OSX 10.6.8. I'd go with a spotlight index rebuild first too. Where are the docs actually stored? Is it possible spotlight is ignoring that directory? Aren't they in the ~/library? 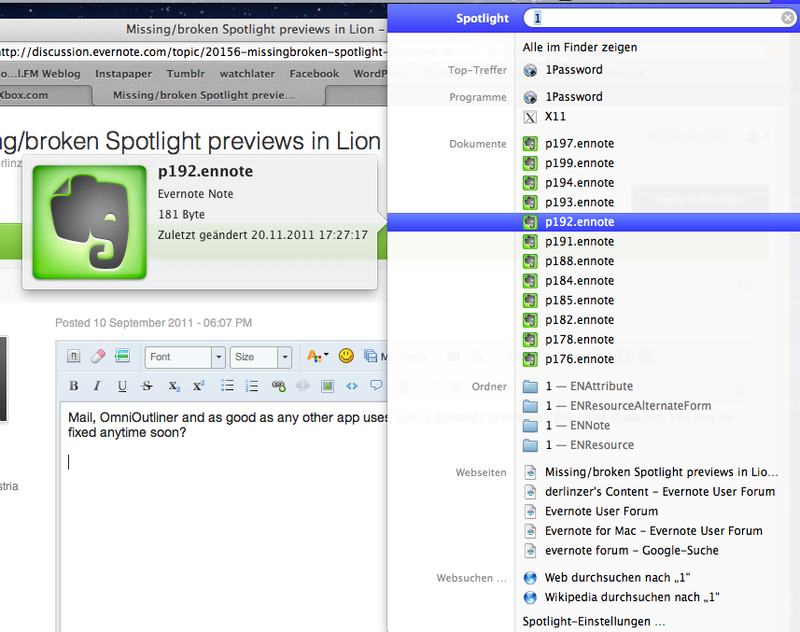 Spotlight doesn't search Evernote in Lion (10.7.4 / 3.1.2 Beta 1) for me either. I do my searching in Evernote anyway but it'd be nice if it still worked. Thanks, I didn't know that. I have the same setup and it looks like my Spotlight doesn't search Evernote notes either. Wonder if that feature is returning soon...? i'll have to check this when i get home, but just last week i was testing out the beta and having no problem searching with houdahspot (uses spotlight indexing). They do monitor the forums and often reply. I'd consider submitting it as a bug. It may be a Lion-related issue, since others have said (above in the thread) that the most updated version of Snow Leopard doesn't have the trouble. Spotlight under 10.7.4 with EN 3.1.1 seems to work as expected. It never hurts to submit a support request, so I second this suggestion, but last I checked (a few days ago) it was working fine for me. I'll give a try again when I am back to my mac later on today. Both of my accounts were indexed and searchable. yep. i just tested it. works fine. I have a note titled "TEST1" and another TEST2. both are in the same folder. When I search within EN, I find both. However, when I search from spotlight, i only see TEST2. This is happening with multiple notes. From EN support, I have uninstalled (using an uninstaller from EN) and reinstalled directly from EN website. I have also deleted the meta cache as instructed. Nothing seems to be working. I am nervous about reindexing my entire hard drive and the spotlight/privacy tab does not 'see' the EN index folders. I have noticed a number of others with indexing issues and wanted to see if anyone has suggestions. I have paid/premium EN support and they seem to be throwing their hands up. Does the search in Evernote always find the correct notes? When I upgraded to Mountain Lion on my machine, I noticed that I was having some issues with Spotlight in general. I did a full reindexing (not just of Evernote), and it's been fine since. Note: I know that Spotlight is not compatible with the Appstore version of Evernote 3.3.0 - I haven't tried it with 3.3.1 to test, as I'm on the direct download version. I haven't pulled your ticket yet, but I know with Spotlight issues, reindexing (just the Evernote directory, or the entire hard drive) does take some time to complete, and there's no real other option to fix it than to do a reindex and wait. I think that the Spotlight Privacy tab can't the EN folders is because Apple have decided to hide the Library folder. I'm not sure why you are nervous about reindexing - kick it off before you go to bed and let it work while you sleep. OK... I reindexed spotlight - the entire hard drive. Spotlight still does not find some of the notes. Also - yes, I am able to find every note if I search within Evernote. I have 1) deleted the cache, 2) uninstalled and reinstalled from Evernote website 3) reindexed the entire hard drive ... and still, Spotlight is not finding some of the EN notes (while EN finds them). Any additional thoughts would be GREATLY appreciated! I would really appreciate it if someone at EN would get on the phone with me to help solve this - - - i have premium support and it would be great if they solved this. Evernote does not offer Phone support (even for Premium members), only email, and Chat for Premium members. I have pulled your ticket, and I see it's with a specialist, who recommended the same course of action I have. So, if Spotlight isn't indexing all the notes that you're pulling up in Evernote even after following the steps he gave you (and what I said here), then you're encountering a bug. Support isn't able to fix a bug in the software (even if they were on the phone with you), but once they identify that you're encountering one, they can file it for you so that the engineers can work on it to be fixed in an upcoming version. Odd. I had the same message, and I thought it was because I do have another account and I also have shared notebooks. I'll have to look into this as well. Those that are reporting that it works - are you using the App Store version or the downloaded version? When I had the downloaded version, it dropped the spotlight component into my ~/Library/Spotlight, but the App store version doesn't seem to put it anywhere. Answering my own question here - "mdimport -L" shows that the importer is in the list. Still doesn't work though using the App Store version on 10.7.x. Looks like I'll be swapping back! My Spotlight isn't indexing notes either Mountain Lion 10.8.2 and EV 3.3.1 - what can I do about this? I'm having the same problem and would like to see if a direct download of the app from Evernote would solve the problem. But it doesn't look like one is available anymore. When you go to Evernote's Download page, it links to the Appstore. Am I missing something? Same here. No evernote notes in Mac OS X 10.8.2 with Evernote 5.0.0 MAS. So what's going on? Are tech support on this? has there been a bug report? Anything? So it's a problem with Mountain Lion? Is there workarounds for Evernote to implement? Is it a bug in the way EV actually accesses stuff or is a confirmed OSX bug? Do techs check topics here at all? This is a user forum, apparently Evernote staff read pretty much every post but there is no expectation that they will respond to a thread. There is no universal problem with Mountain Lion or with Evernote, because Spotlight is indexing my Evernote notes just fine. One of the suggestions that I would make is that you switch to the home brew version of Evernote if you are currently running the appstore version. There have been issues in the past due to the new way that Apple has apps do things (http://discussion.ev...es/#entry159279). I doubt that is the case anymore, but you never know, and it won't hurt to switch. Here are some instructions for backing up, uninstalling, and re-installing with the home brew of Evernote. Here are some instructions for getting Spotlight to re-index your drive. I don't know if my suggestions above will help with the problem, but they will get you onto a more full-featured version of Evernote that is free of Apple restrictions on the app, and it will address three of the most common troubleshooting steps for any issue: a fresh re-installation of the latest version of Evernote, a re-indexing of your database, and a re-indexing of Spotlight. Once you get these potential issues out of the way, you know there is something more serious going on. See the note I just posted in the knowledge base section. This worked for me on Lion and Evernote 5.0.4. I had the same issue with Spotlight not searching any of my Evernote content. I was working with the App Store version. Uninstalled it completely then went to Evernote.com and did the download from there. Upon installing I did get a prompt that the install file detected an App Store version but it seems to have overwritten it and my mac is currently reindexing. When I do a Spotlight now, Evernote Notes are showing up in the list. I did all this on my MacBook Air running Mountain Lion version 10.8.4. Within a few minutes I could see notes as results found in Spotlight. 2014 and this problem seemingly hasn't been addressed yet. Is anyone else still having this issue? edit: I have tried the above and Spotlight is still not indexing Evernote notes. Locking this thread so others find this response. Thanks for your understanding!